Assembles in seconds to fit ALL laptops and netbooks – using wider or narrower slots. Stored size: It’s 12.5” long, 3.5” tall at its tallest point and ½ inch wide. Assembled size: 12.5” long by 9” wide (on the outer position – regular laptops) and 6” wide (on the inner position – netbooks) By 3.5” tall at its highest point. The Laptop Stand offered by Keynamics LLC allows for very comfortable typing on your lap top, while avoiding the aches and pains associated with poor postures, carpal tunnel syndrome & musculoskeletal disorders. 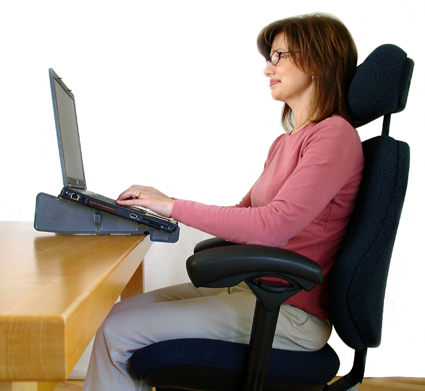 Also referred to as notebook stands, they meet the ergonomic guidelines of the Occupational Health and Safety Administration (OSHA) for ergonomic computer workstations, such as their emphasis on reclining and frequently changing your position as you work. See OSHA’s site at osha dot gov and search “Computer Workstations” – Our stand complies! Both OSHA and the Centers for Disease Control and Prevention have spoken out, on the ergonomic problems that notebook computers cause. Keynamics has solved most of the issues associated with laptops and poor posture, such as the need to raise your screen toward the plane of your eyes and the need to hold your wrists at a neutral posture. We allow you to achieve this neutral wrist posture, regardless whether you use our riser on top of your desk or cantilevered off the front edge of your desk. Use it as a notebook platform to safely cantilever your laptop out over the front edge of your desk so you can recline as OSHA recommends. The “lateral movement contact points” allow you to quickly move your laptop out of the way, freeing up your desktop for other tasks. Reach your ergonomic goals without having to buy a separate keyboard or a monitor. The Aviator functionally separates the keyboard from the screen, by changing both the user’s position and the laptop position. Other stands only change the laptop position. Furthermore, they were wrong all those years when they told you to sit up straight. Sitting up straight compresses your spine. Think about it, would you drive a car sitting up straight – not for long! Reclining transfers much of the downward pressure off your spine. 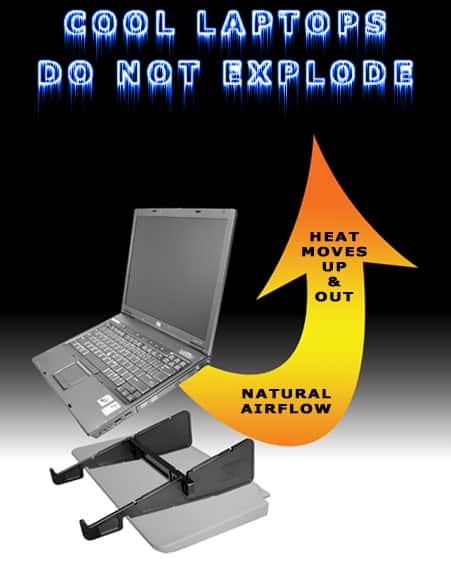 Laptop heat buildup: As an added bonus, the airspace created by the angle and open space below your lap top and heat convection reduces laptop heat. Note: With the recent increase in Stand Desk users, we are finding that spinning the Aviator laptop stand around 180 degrees (backwards from normal) produces a good reverse angle for typing while standing. We have sold thousands of Aviators and the feedback has been tremendous. Our Laptop Stand users are claiming to achieve neutral postures, reduction in repetitive stress injuries, less fatigue, carpal tunnel syndrome, wrist pain and neck pain. 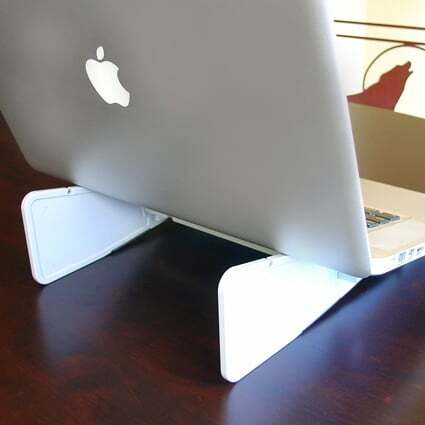 I actually bought two of these aviator laptop stands through you in black over ten years ago. Maybe longer. I gave one to my daughter who still uses it. I have the other one, but can’t locate it. I’d like to buy two more, but before I order through you, I’m trying to figure out if Bed Bath and Beyond carries it. I can call and ask, but wondering if you know. Will the shipping for two be the same as for one? And is that shipping cost $7.50? Hi Kathy – I emailed you and thanks for being a repeat and happy customer! I bought two of these stands (one for home and one for my bag) in the early 2000s and have used them every day since. As someone with very low vision, the stands have been an invaluable aid in respect to positioning the laptop so as to make it significantly easier for me to see. I truly could not use a laptop without one of these. Additionally, the stand works well with every size of a laptop (13 in to 17 in) I have owned, the design is simple enough that there is almost nothing to break or wear out, it is compact and unobtrusive while travelling, it keeps the laptop cooler than just sitting on the desk, and… I am probably going to buy an extra one of these and stick it in a drawer just to be prepared if the company ever goes out of business.